Last night at a freshly finished sales centre, King Plus Condos hosted its VIP Insider Event to acclaim. Tasty appetizers circulated, wine poured and spritzers bubbled as close friends of the project got the first look at the model vignettes and the promising 3D model. Among those who spoke was Prishram Jain, the building’s architect who spoke eloquently about the challenges and opportunities that go along with working with a building that has stood since 1878(!). He is proud, he said, that his design explores how the modern tower works both with, and in contrast to, the solemn but gracious historic street-level facade. 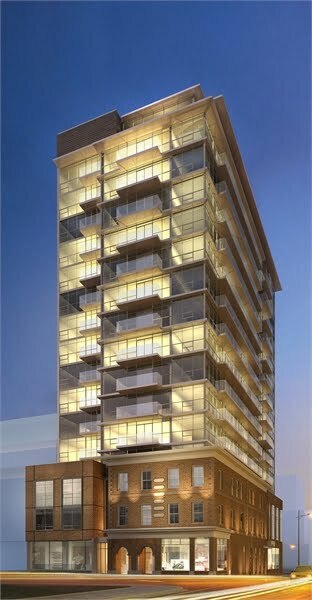 King + Condos is to be a 17-storey, 132-unit condominium residence at the corner of Sherbourne Street and King Street East – putting it smack dab in the middle of the quickly evolving King East neighbourhood. It is being developed by Plus Development Group and Terracomm Development. We snapped a pile of pics, so let’s get to ’em! To learn more about King Plus Condos check out their cool new website – and check back here soon for the latest buzzzz. . .